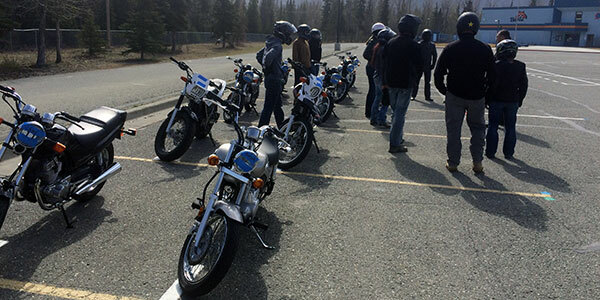 ﻿ Motorcycle Classes and Education by Valley ABATE Alaska - Motorcycle Awareness and Training Lessons. Welcome to Valley ABATE Riders Education! We are proud to offer these motorcycle classes, IN THE VALLEY. The courses will be offered from May thru September. All classes are taught using MOTORCYCLE SAFETY FOUNDATION certified rider coaches. Upon completion of the Basic Riders Course (BRC), Basic Riders Course 2 (BRC2) you will be allowed to waive the written and road test at the Department of Motor Vehicles. Your completion card must be presented to the Department of Motor Vehicles to receive your Motorcycle Endorsement. Your completion card is valid for one year..
You are entitled to one year free membership to Valley Abate. We meet @ 7:30pm, on the 3rd Thursday of every month at Palmer Moose Lodge 793, 1136 S. Cobb St. Completion of this course may also reduce your insurance rates. Check with your insurance provider. This class consists of 5 hours of classroom study, and 10 hours of riding time. The classroom sessions will be located at the Matanuska Telephone Association Building, 480 Commercial Drive, Palmer. The range will be located at the Butte Elementary School, 4006 South Butte Road, Palmer. You will learn the basic fundamentals of motorcycle riding, risk awareness and management, braking swerving and cornering skills. There is a knowledge and skills test to complete this course and receive a completion card. Motorcycles are provided for each student. Riding is done on a closed course. After you sign up for the Basic Riders Course of your choice, you will need to TAKE YOUR RECEIPT to one of following dealers to pick up your RIDERCOURSE HANDBOOK, you will need to read this, do the homework and bring it to class with you. TEAM CC KAWASAKI, in Eagle River. RON HARVEY’S CLASSIC MOTORCYCLES, in Palmer. This class consists of 5 hours of riding time. There is no classroom session. The range will be located at the Butte Elementary School, 4006 South Butte Road, Palmer. It’s for experienced riders that are already on the road, on their own bike. This will hone your riding skills and teach you advanced techniques, to increase your safety and enjoyment of motorcycling. There is a knowledge and skills test to complete this course and receive a completion card. You will ride your own motorcycle. Your bike must be street legal, with current registration, and you must have proof of insurance, you will be asked to produce these documents. More classes will be added as needed, classes will be offered all summer! All motorcycle classes are pre-paid, no exceptions. There will be no refunds after the start of class, or if you drop-out after any class session. There will be no refunds if you fail to possess proper registration and insurance for your motorcycle prior to an Experienced Riders course. If you wish to re-schedule your class reservation, you must notify us seven days in advance to avoid a $25.00 re-scheduling fee. If you wish to cancel your class reservation, you must notify us seven days in advance to avoid a $25.00 cancellation fee. Valley ABATE is committed to protecting your privacy. The information we collect is to ensure secure ordering and to provide a more personalized shopping experience. If you have any concerns or complaints be sure to contact us. How much information do I have to give? What are you going to do with my private information? We require only the personal information that is needed to safely process your order and for contacting you about your purchase. It is used exclusively for that purpose. Will my information be given to another party? Your personal information is not shared with any other party. Do you purchase information about your customers from other companies? Valley ABATE does not send unsolicited e-mail. Can I pay with a check or cash? What if I show up late for class? Class goes on without you, you will not be allowed to come in late. You will have to re-schedule. There is no guarantee of availability of another class. DON’T BE LATE!! This is a rain or shine course. Some time in your riding experience, you will be caught in the rain. If it looks like rain, bring some gear. Helmet, we have a few loaner helmets, not enough to go around. Eye protection, sunglasses, prescription glasses, goggles, safety glasses, or a face shield on your helmet. Long sleeves, jacket, sweatshirt, etc., arms must be covered. Gloves, full-fingered. Long pants that aren’t baggy. Over the ankle footwear, no canvas sneakers. Raingear, if it looks like rain. Your own water and snacks, we provide portable toilets. Do I need the DMV issued Learners Permit? No Learners Permit is required, once you pass our course you can have your license endorsed. How do I use my Military Voucher to pay for a rider course? You have to call 907-746-7295, and we will help you sign up. Thank-you to all our sponsors -- Geico Insurance, Ron's Honda, Ron Harvey's Classics, Performance Yamaha, Team CC Kawasaki, Team CC Suzuki and MTA. Please consider these businesses for your future purchases. Just wanted to say thanks for the Riders Class. Joe was a great instructor. The course did just what it advertised: It honed riding skills and taught advanced techniques, to increase your safety and enjoyment of motorcycling. So thank you! The Rider Education classes are a great investment If you are new to motorcycles or if you want to improve your skills. The coaches are very informative and provide a fun environment to learn. Amazing Riders Education program! Military friendly, super helpful and knowledgeable! © Copyright - Valley Abate - Motorcycle classes serving Wasilla, Palmer, Butte, Matanuska, Houston and Anchorage, Alaska area.